Career choice options – student thinking of future education. Young woman contemplating career options smiling looking up at thought bubbles on a blackboard with images of different professions. Photo courtesy of Shutterstock. 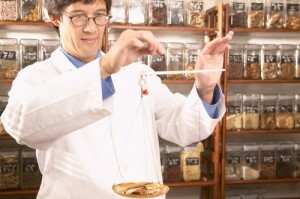 Male herbalist doctor weighing Chinese medicinal herbs. Photo courtesy of Shutterstock. In general as people, we tend to accomplish more when we feel good about ourselves. The same goes for the workplace. In the following post, learn four ways to help employees feel happy and healthy on their entry level jobs. Woman crying at work after being dismissed. Photo courtesy of Shutterstock. Smiling female flight attendant inside an airplane. Photo courtesy of Shutterstock. Outline: There are different perspectives to the job of an air hostess. While for some the job is brilliant that gives you an opportunity to see the world for free, there are others who think they can do better on earth than up in the air. Get a better understanding of the job profile and required skill sets for a life up in the air.